"Bold and savage" spending cuts are on the agenda and some cherished Liberal Democrats policies are at risk at the start of the party's annual conference. Savage is not a word associated with Liberal Democrats, but in this new era of austerity they have joined the hair shirt competition as their party conference begins. Their pledge to bring back free university tuition everywhere is on hold. Child benefit for the rich is patently silly and unfair, they say. The party's leader Nick Clegg told a conference rally in Bournemouth they had to be "realistic" about the promise to abolish tuition fees, as new figures out today show total public borrowing has risen above £800bn for the first time. On the opening day of the Lib Dems' annual conference in Bournemouth, Mr Clegg said he had to be "realistic" about whether the flagship policy was affordable given the country's mountain of debt. The pledge to scrap tuition fees for university students has been one of the Lib Dems' most popular policies and Mr Clegg insisted he still wanted to do it if he could. Any move to keep the policy out of the party's forthcoming general election manifesto is likely to anger Lib Dem activists and hit its support among students. 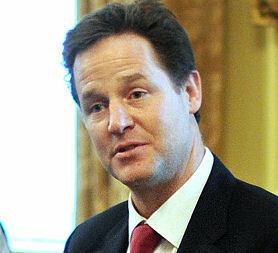 "I believe tuition fees are wrong, I believe they need to be abolished, I want to do it as soon as possible," he said. "But we need to treat people like grown ups, and we need to be realistic. "Ending tuition fees would cost billions of pounds every year. We need to be certain we can afford it before we make any promises." "But I can make this pledge - at the next election we will have the best, most progressive package for students of any mainstream party." Mr Clegg also warned of "savage and bold" cuts in spending under a Lib Dem administration, but suggested they would be in areas that allowed vital public services to be protected. "Yes I have said there will need to be cuts, cuts that are savage and bold," he said. "But we will make those cuts so that we can be equally fierce - equally savage - about protecting the services that matter most, just as we put the nation's finances back in order. "So if ending tax credits for high earners is the price we pay for cutting class sizes and investing in disadvantaged pupils, so be it. "If we need to tell the highest paid public sector staff they won't get an increase in their pensions, so that we can afford to keep teachers, nurses, policemen and women in their jobs, so be it."